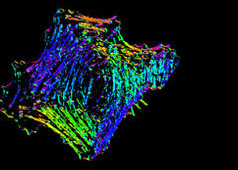 Recent data suggests that ventral stress fibers are created by reorganizing pre-existing dorsal stress fibers and transverse arcs .Other contrasting models for the formation of ventral stress fibers not covered in this resource include annealing or fusion of short actin bundles that are associated with focal adhesions . Thus, the exact mechanisms for ventral stress fiber formation remain to be elucidated. Similar to other cortical actin networks that are composed of actin bundles (e.g., microvilli, filopodia, stereocilia), the elongation of actin filaments in the lamellipodium would presumably contribute to the retrograde flow of actin away from the leading edge and towards the cell body, thereby fostering interactions between the dorsal stress fibers and the transverse arcs . Transverse arcs filaments are thought to supply the dorsal stress fibers with filaments of mixed polarity as they are assembled; how this is achieved is relatively unknown, but based on experiments using purified components , permeabilized cells  and live cells , it has been suggested that myosin bundles may recruit the filaments and facilitate polarity sorting  (reviewed in ). In line with this concept, it seems reasonable to suggest that the myosin filaments may impact the dynamic interaction between the transverse arcs and dorsal stress fibers and foster their association into ventral stress fibers. 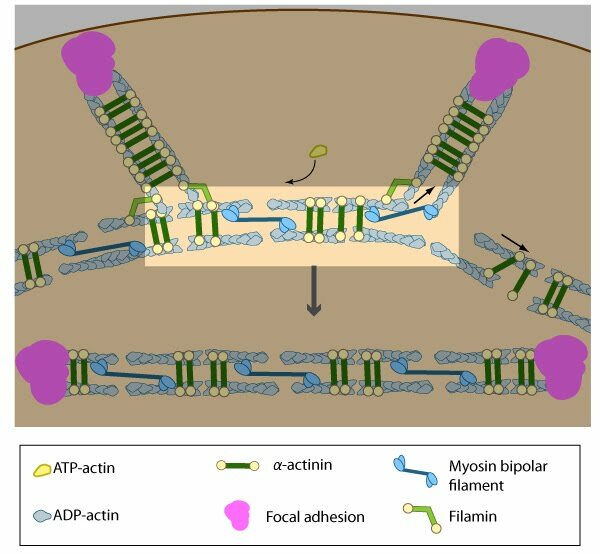 Many actin binding proteins that are found along stress fibers or at their distal adhesions (e.g., α-actinin, filamin, zyxin, talin, vinculin, espin , caldesmon ) are mechanosensitive and they are known to regulate the structure of the actin cytoskeleton (reviewed in ). Unfortunately, their exact function in stress fibers is relatively unknown. 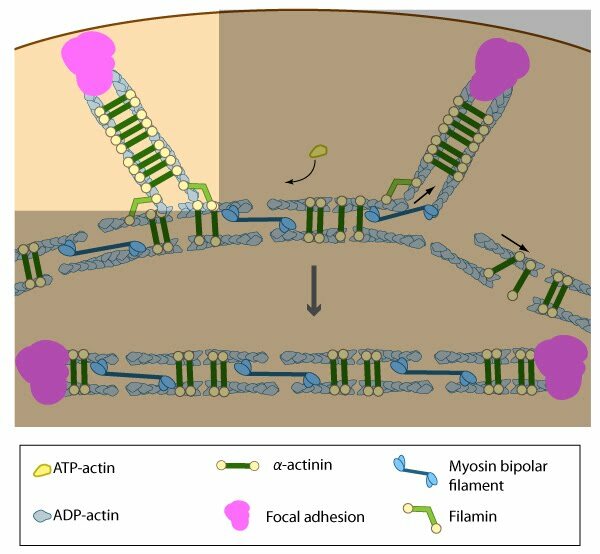 Ventral stress fibers association likely involves a dynamic interplay between number of actin binding proteins and myosin motors within the filament bundles. Once the bundled actin filaments in dorsal stress fibers fully interact with the transverse arc filaments, the bundles become aligned and completely ‘fuse’ to create a cohesive contractile structure . 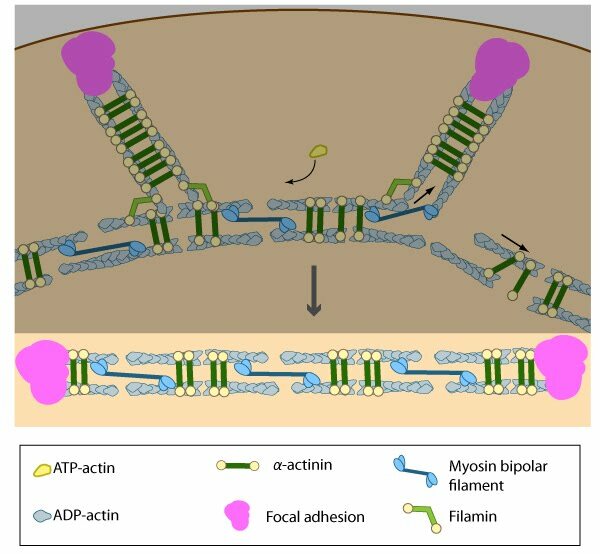 Although it hasn’t been demonstrated experimentally, it is reasonable to suggest that the actin-myosin interaction and initiation of myosin II-dependent contractions will help foster ventral stress fiber alignment in a manner similar to the reorientation of lamellipodial and filopodial actin filaments during cell migration . 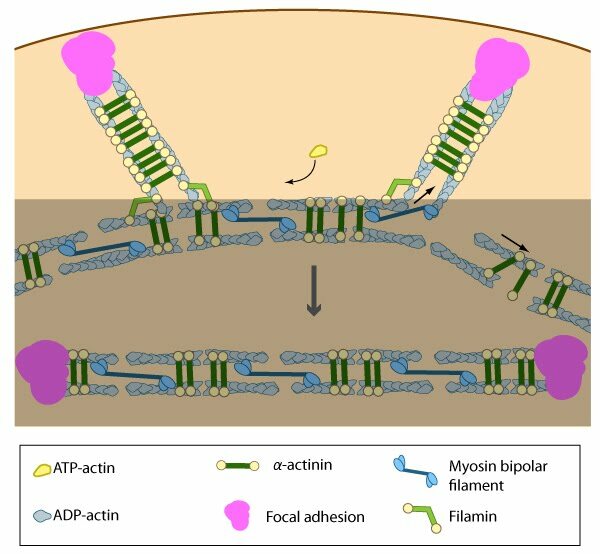 Factors that impact tension-dependent cell adhesion and actin bundle formation are also expected to be key contributors to ventral stress fiber alignment and maintenance. It should be noted that although transverse arcs formation and stability is strictly dependent upon myosin II activity, the formation and stability of ventral stress fiber appears to be somewhat less dependent . Furthermore, ventral stress fibers are fairly stable and their components exhibit the slowest turnover rates relative to dorsal stress fibers and transverse arcs . Once the actin bundles are aligned and completely ‘fused’, the completed ventral stress fiber is anchored by focal adhesions at both ends and the contractile bundles are dispersed throughout. Once the actin filaments and myosin bundles are aligned, contractile activity along the filaments further organizes the bundles and brings the stress fiber to a completely ‘fused’ state: the completed ventral stress fiber is anchored by focal adhesions at both ends and the contractile bundles are dispersed throughout. Although stress fibers appear to contract continuously, the contractions are not uniform along their entire length  and the contraction strength varies with the adhesion strength (at least in muscle fibroblasts ). The extent of contraction also directly correlates with altered transcription of certain genes . 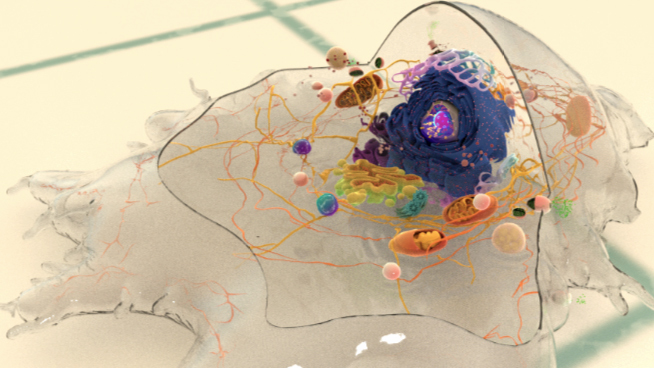 Contractile activity on a whole-cell level will influence the structural organization of the cytoskeleton and stress fiber stability/activity in ways that impact the cell morphology. For example, both contraction strength  and regulation of myosin II activity  correlate with stress fiber formation and they regulate the overall stability and integrity of stress fibers . There is also a reciprocal relationship between the strength of contractions and changes in cell morphology: cell morphology contributes to the formation of stress fibers and the resulting magnitude of contractile force that can be generated , while in reverse, the extent of contractions will influence the cell morphology . These examples underscore the importance of elucidating the mechanisms and molecules responsible for integrating and regulating contractile activity in stress fibers.